Microsoft is setting the price of its new Surface tablet below comparable versions of Apple iPad, signaling its intent to grab a slice of the booming tablet market. The world's largest software company, which announced its surprise foray into computer manufacturing in June, said it would sell a 32-gigabyte (GB), Wi-Fi only version of its tablet at $499, versus $599 for a comparable version of Apple's new iPad. 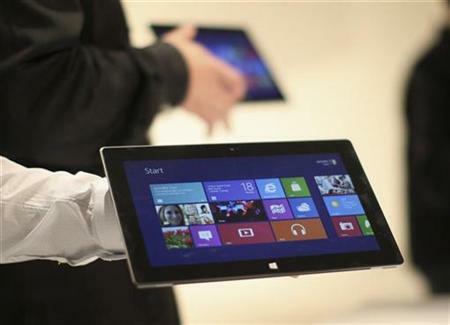 Microsoft's tablet, which is taller and slightly heavier than an iPad, will go on sale on October 26 as the company launches the new touch-friendly Windows 8 operating system. A limited number will be available for pre-order from a Microsoft website from Tuesday morning. The company is hoping the Surface - along with Windows tablets from other hardware makers - will challenge the dominance of Apple's iPad, which has 70 percent of the tablet market after essentially inventing the category in 2010. The iPad's popularity demolished the market for mini-laptops called netbooks, and crimped the sales of full-scale PCs, eating away at Microsoft's Windows market. Based on a Nvidia Corp chip designed by ARM Holdings, the Surface will run a simplified version of Windows 8 that is not compatible with old Microsoft applications. However, the tablet will feature new app-style versions of Office mainstays such as Word, PowerPoint and Excel, and will include Xbox games, video and music apps. The Surface, with two cameras and a USB port, will be Wi-Fi only. Microsoft has made no mention of a wireless-enabled version. On top of the basic model, Microsoft will also offer a 32GB model bundled with a black 'Touch Cover' - that doubles as a keyboard - for $599, and a 64GB version with a black Touch Cover for $699. That compares to $699 for a 64GB Wi-Fi only version of the new iPad. Since announcing the Surface in June, Microsoft had been silent on the price range, saying only that it would be "competitive" with similar products. Some market watchers had speculated that Microsoft might price its first tablet even lower to compete with Apple's less-powerful iPad 2, which costs $399, or smaller rivals such as Amazon.com's Kindle Fire HD and Google Inc's Nexus 7, which start at $199. Alongside Microsoft's physical stores in the United States and Canada, the Surface will be generally available online from October 26 for consumers in Australia, Canada, China, France, Germany, Hong Kong, Britain and the United States. A second, heavier Surface tablet aimed at the new generation of lightweight laptops called "ultrabooks," running on traditional Intel chips, is expected on the market in a few months.